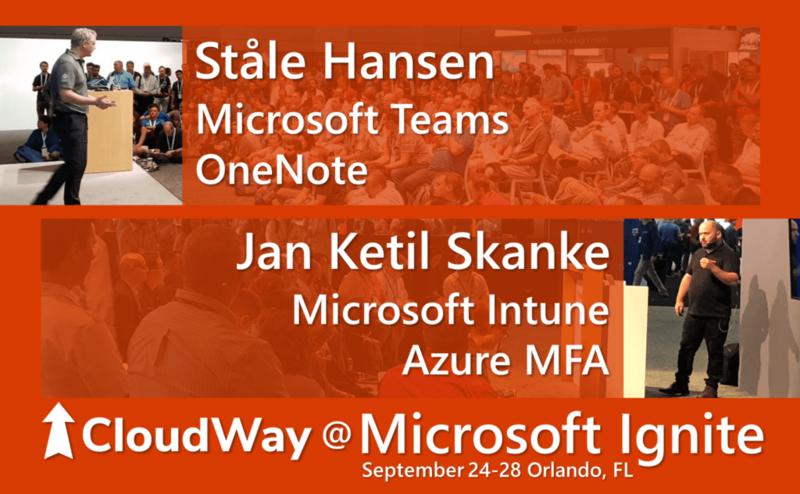 CloudWay is very proud that both our MVPs Ståle Hansen and Jan Ketil Skanke are speaking at Microsoft Ignite. They will share their insights on Microsoft Teams, OneNote, Azure MFA and Microsoft Intune. CloudWay is also very happy to be sponsoring “Norsk Aften” for the second year, this time together with Pexip, Microsoft, and KPMG. CloudWay will be part of a total of four theater sessions. A theater session is held in secluded areas around the exhibition hall and is 20 minutes long. These are the types of sessions that will give you concrete nuggets about defined topics. Ståle and Jan Ketil are also hosting two community meetups. A community meetup is a 75-minute event where the community event organizers talk about a topic and the audience can ask and discuss around that topic. If you have any burning questions at Ignite, look up a meetup that suits you and bring your questions. earn structured thinking on how to use Microsoft OneNote to collect all thoughts, ideas, workshop notes, and actionable emails inspired by productivity methodologies such as GTD and the Pomodoro technique. Get tips on how to set up the OneNote clients correctly across mobile, web, and computer. Learn how to succeed with meetings and the new features cloud recording and live events. Get an understanding of capabilities, best practices, and how live events are used to create external webinars and internal town hall meetings. Make meetings searchable in Microsoft Stream with cloud recording and transcripts. Meeting recording just became useful! Attendees will have the opportunity to sit and ask their burning questions about Microsoft Skype for Business or Microsoft Teams. Your MVP hosts will answer questions from migration, co-existence, video/voice how-to, and any others related to general troubleshooting. Get access the collective brainpower of the MVP community with small table sessions. There will be an interactive quiz at the end with some teams prizes. Come join us! colleagues. CloudWay is proud to team up with Microsoft, Pexip, and KPMG to bring Norsk Aften to Microsoft Ignite, the second year in a row. Mingle with fellow Norwegians over some drinks and have fun Tuesday 1730 at Bahama Breeze. Sign up today! Microsoft Ignite is the premiere event organized by Microsoft for worldwide audience for IT Pros, decisionmakers, and influencers. This is where you get to learn what’s new, how it works and how others have succeeded with Microsoft technology.